Cincinnati Police Say 15 Shot, 1 Killed In Nightclub : The Two-Way A shooting in what police say was a packed nightclub in Cincinnati has left 15 people wounded, one of them fatally. 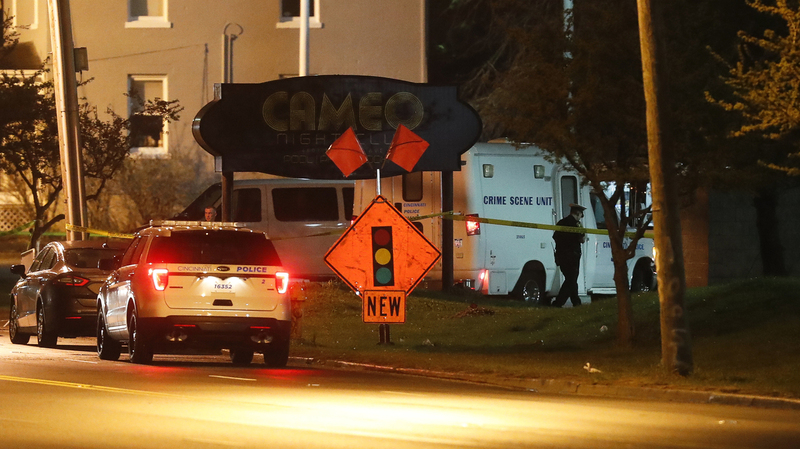 Police operate outside the Cameo Night Club after a reported fatal shooting on Sunday in Cincinnati. On certain nights the club admits people age 18 and above. "Saturday nights it's a very young crowd," Williams said. "We have had incidents here in the past, but ... this is the worst by far," she told reporters. Williams described the scene during the shooting as "just a lot of chaos when the shots went off." She said earlier in the evening there was a large crowd inside, but that "by the time shots were fired, individuals ran outside, so there's not a lot of people inside the club." She said it was unclear what instigated the shooting, but that it began inside the club. There were four officers working detail outside the club at the time, who administered aid to shooting victims and attempted CPR on the one person who "didn't make it," Williams said. Assistant Police Chief Neudigate later tweeted that the motive "is still unclear but there are no indications this incident is terrorism related." NPR's Julia Holmes Bailey contributed to this report.